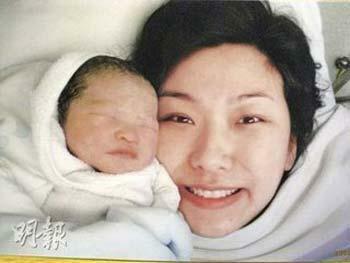 Mok Ho Yan, wife of Alex Fong Chun gave birth to a baby daughter at 3pm in the afternoon. Weighing at 5 pounds 11 ounces. Yesterday Alex arrived at the hospital around 1pm. After his wife gave birth to his daughter by Caesarean surgery a hour later, Alex quickly informed the paparazzi that were waiting at the entrance of the hospital “I have become a father, it’s a girl. She weighs 5 pounds 11 ounces, although she’s a little light her face resembles myself and Ho Yan. (Did you see the moment’s of your daughter arriving to this world?) “No I didn’t because if you were to go into the delivery room, you would need to give an extra $500. I want to save money”. Alex stated that the baby was arranged to be born during a specific time/hour. She has not been named yet but he would like to choose her name himself. Afterwards, Alex took some reporter’s camera’s to the delivery room and happily took some photos with his wife.